There was a day that when asked about third party lenses, I would have simply said, “avoid them”! That day has passed. I still believe that in most cases you should buy the lenses made for your camera, by the camera manufacturer. There are times now when you might should consider a third party lens. (1) If your camera maker does not offer a particular focal length or speed, you need. (2) If the lens you need from your manufacturer is simply too expensive for your budget. (3) If an independent lens maker makes a particular product that you need and your camera maker does not make the same product! What about quality? That is a good questions and it is not easy to answer. First know that all lens makers even the big boys like Canon and Nikon make several levels of lenses in terms of quality. If your camera maker offers two 70-300 lenses and the price difference is very significant, you can bet the build quality and optical quality probably is too! When your grandfather said, “You get what you pay for!” He knew what he was talking about! Twenty years ago a independent lens was rarely as good as the manufacturers original lenses, but the third party folks have really gotten their act together and now produce some very fine optics. The mechanical quality is all over the board, but honestly it is too, even with the major manufacturers. How about the premium brands like Zeiss? Zeiss lenses are expensive, very expensive, and if you can afford them, probably worth it. Zeiss has a very long history of making extremely good glass, well designed and set in premium quality constructed barrels and mounts. Some Zeiss lenses are clearly superior, others pretty close to the quality of the other best lenses in their focal length. How good is the consistency from lens to lens within a manufacturers line? Let’s say you buy a 70-200 f 2.8 zoom lens from any major manufacturer or third party company. 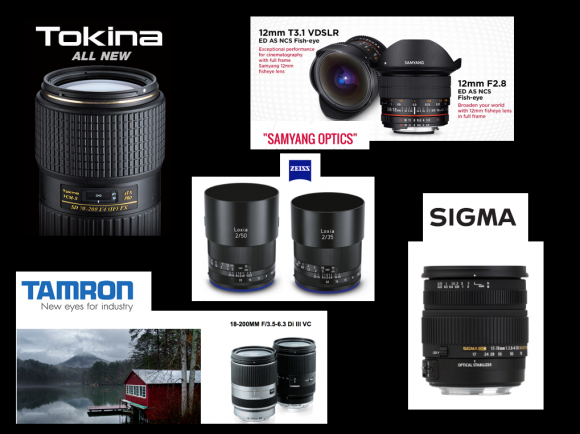 If there are six lenses new on the shelf at the dealer, does it matter which one you buy? You bet! All manufacturers will have small differences from lens to lens in the manufacturing process. The better companies have tighter quality control which makes the performance more consistent, but does not eliminate the fact that an occasional lemon slips through. Does your lens maker pull one out of every 3 from the line to test, or 1 of every 10, or maybe one of every one hundred!!!!! So what can you do to make sure you get a good value for your dollar spent on lenses? I have several suggestions that will at least put the odds in your favor! A. Be your own quality control department. Deal with a dealer that has a return privilege. When you buy a lens make a thorough test the day you buy it. Have some comparison shots of the same test subject that you’ve made with a lens you have high regard for, and compare them. I have a old building with a brick wall in my town, and at the right time of day when the bricks are cross lit, I can test a lens and see what the sharpness is, corner to corner. I have a couple of other color targets I can shoot. Since I’ve done this with hundreds of lenses, I can tell right away how a lens stacks up. If it doesn’t, it goes back in the box and back to the dealer and I try another. * Now honestly in 45 years of being a serious photographer I’ve had very few lenses that were lemons, but I have had a few!! A great relationship with your dealer is your best insurance against getting stuck with a lens that will be a disappointment. B. Check the lens for build quality. This is hard without taking a lens apart but ask a camera repairmen what they think of the quality of certain lenses. Trust me they’ve taken enough apart to know what’s inside! You can also compare the weight and smoothness of opposing lenses right in the store, and if you trust your sales person, (and why would you be shopping with him if you didn’t!) ask his advice. A good retail sales person that will shoot you straight is incalculable. You can also ask friends who have purchased lenses your interested in about their experience! Lastly you can read test reports, but be careful, some publications accept advertising from the same companies whose products they review! This does not always create a conflict, but it’s wise to be careful! C. Be realistic about your needs. Are you constantly traveling and shooting around the world in harsh environments using your gear everyday? Or do you shoot a couple of times a month and on holidays? You don’t need the highest end, seriously built, lenses for occasional use. D. Talk to friends, associates, and people you meet about their lenses. Ask them if they have been happy with them, if they seem to be holding up. Visceral information is valuable! Lenses are one of the very most important parts of the imaging system. Do your homework, check around and test your selections and then go out and use them to make great images!! My preference has always been for OEM glass which is more likely to be matched to your camera. That said, when I had less money to spend I found the old “built like a tank” Tokina ATX-PRO lenses appeared to be above consumer grade and a notch or two below Canon L glass. I often told Don Nelson that if Pentax ever sold its lenses in other mounts Tamron would probably go under. Pentax made (makes) great glass! I remember their 70-200 f 2.8 was probably the sharpest one on the market!